I have a lot of nostalgia for Parker pens. Stationery has always been a geeky passion of mine. It felt like a rite of passage when my parents bought me my first fountain pen back in junior school. Of course, it was a Parker pen - a pearlescent purple Vector style. At the time I totally loved it. The pen made me feel a little more grown up & I enjoyed practicing my joined up handwriting. They were somehow really satisfying to write with. These days thinking about fountain pens brings back memories of leaky cartridges & those horrible ink eraser pens. Didn't you just hate it when your friends would borrow your pen & then the nib would adjust to their handwriting leading to hours of scratchiness? By Year 9 I'd had enough. I switched to biros and never looked back. That led onto a whole host of coloured gel pens & highlighters for revision. 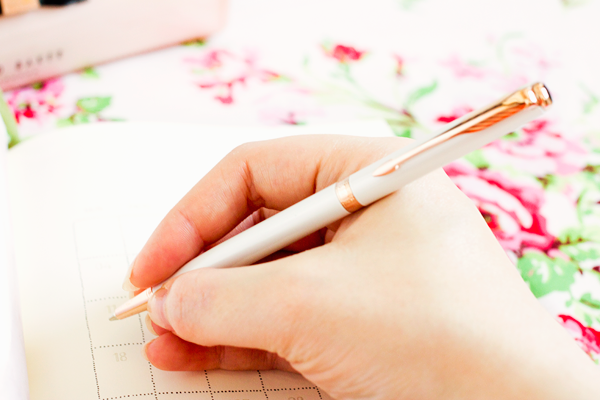 I love how I can relate every kind of pen to different times in my life. I've always appreciated a good quality pen and I must've spent hundreds on them throughout the course of my design degree. Buying Prismacolor markers in every shade of grey & infinite amounts of Sharpies got rather expensive! I mainly work on my computer now using a graphics tablet but I still use pens to jot down ideas and sketch things out. New stationery bits excite me greatly, I feel like they're one of those small pleasures in life. So I was overjoyed when I was sent this utterly sophisticated Parker Sonnet ballpoint pen by Pen Heaven. I guess I'm technically considered a grown up now (really though?) so a grown up pen seems more fitting for my handbag. I had to write my first ever cheque the other day for some of Chloe's school stuff. Even though I had to ring up my mum to make sure I filled it in properly, in my mind it was another one of those adult milestones. It felt even better writing it out with my new Parker pen. What I really like about Parker pens is how smooth they are to write with. I also note down a lot of info for my blog reviews so having a comfortable writing implement is fairly important to me. This pen features Quinkflow technology for better writing performance. 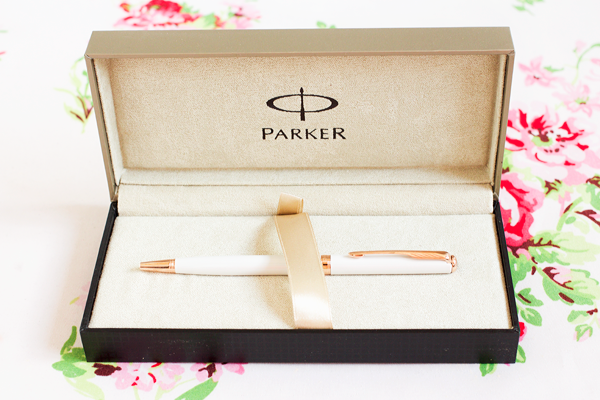 Sonnet is one of Parker's signature collections and this slimline ballpoint is so pretty & feminine. 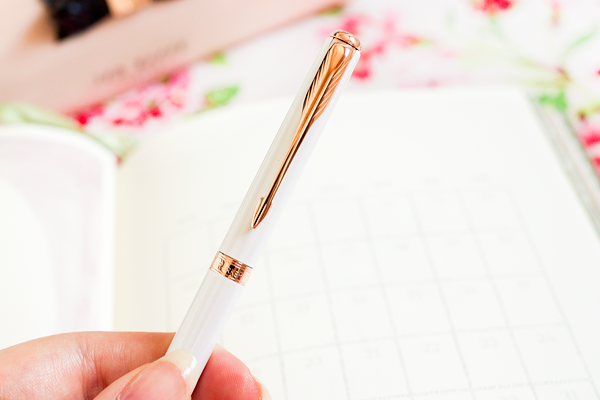 I adore the pearlescent finish - just like my old fountain pen - and the rose gold detailing too. It has a twist opening mechanism and I always go for pens with black ink because it makes my notes & sketches easier to scan in. The pen came in this lovely presentation box and Pen Heaven specialise in luxury engraved pens so you're bound to find the perfect personalised present for any stationery lover. 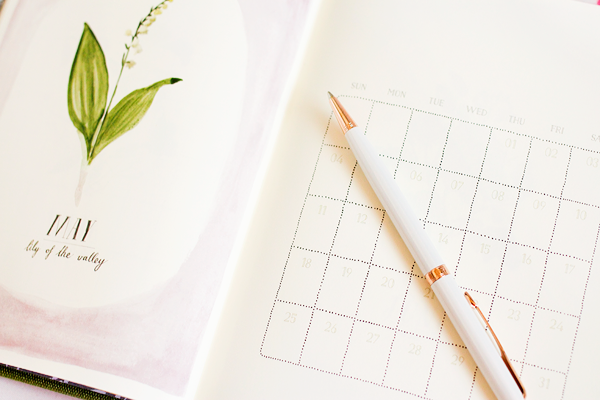 Do you get nostalgic about stationery?